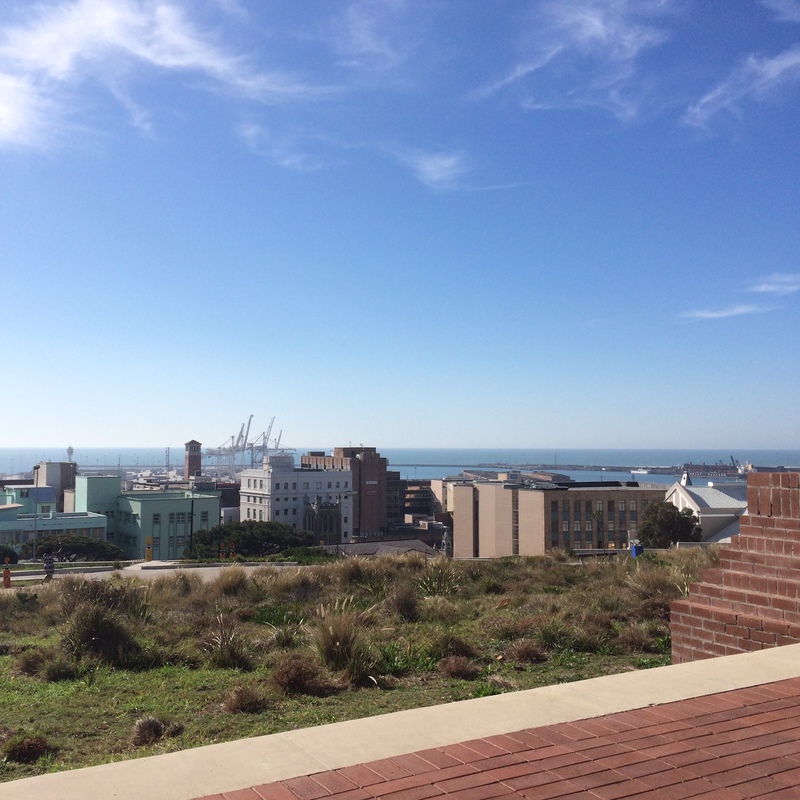 Standing in the Donkin Reserve gazing over Port Elizabeth, the CBD below looking as if it may tumble into the bay, I realised that my perception of this city had been entirely wrong, and it was a wonderful thing. 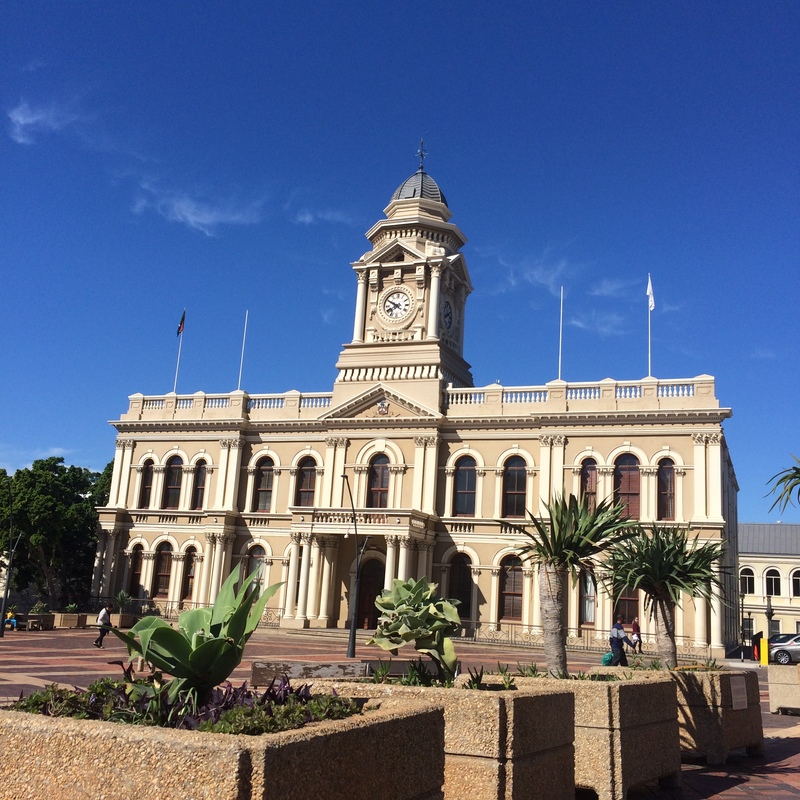 Port Elizabeth’s CBD is like one of those inspiring and miraculous stories of a recovering junkie. She’s been through the mill, hung out with dodgy characters, looked like a lost cause and then she went to rehab. After years of grimy decay, she’s back – plumper, livelier, wiser, more determined and creative and with the colour back in her cheeks. While I realise that’s a fairly weird analogy, it is apt for this inner city that found itself falling into disrepair and decrepitude at the end of the last century (sheesh, I sound old). In 2004, the Mandela Bay Development Agency started its first project to regenerate the area and it’s just been getting better and better. I have to admit I was somewhat mean about PE in the past. My experience of the city consisted of fleeting visits as a child to get groceries to stock our beach shack in Port Alfred in December. Memories of Christmas-crazy, Boney M-filled, Checkers-trolley-into-your-ankles trips calmed slightly by a visit to the magical old library and gelato (with real bits of chocolate) from the hole-in-the-wall ice cream shop as a reward for surviving. Some years later, as a student at Rhodes, PE to me was the occasional trip to Greenacres – a real shopping mall, which Grahamstown-of-yore didn’t have … What bliss, I’m not really a mall fan – and a long, dark, laser-infused night in the docks at one the first raves there. Youthfully oblivious of our own mortality, we drove that treacherous road between Grahamstown and PE on the back of a bakkie, hot-pantsed and silvery-topped. After dancing the night away, we returned as the sun rose over the bay. We didn’t even stay to look around. So, yes, my impression was that of shopping malls and dark dockside warehouses, interspersed with cars with CB number plates. Standing up there in the Donkin Reserve, I had to to admit that I was wrong. Certainly about 2017 PE, interspersed by the more inclusive EC number plates. As an aside – I miss the town-specific plates. They satisfied (some of) my curiosity about where people were from. I stray. 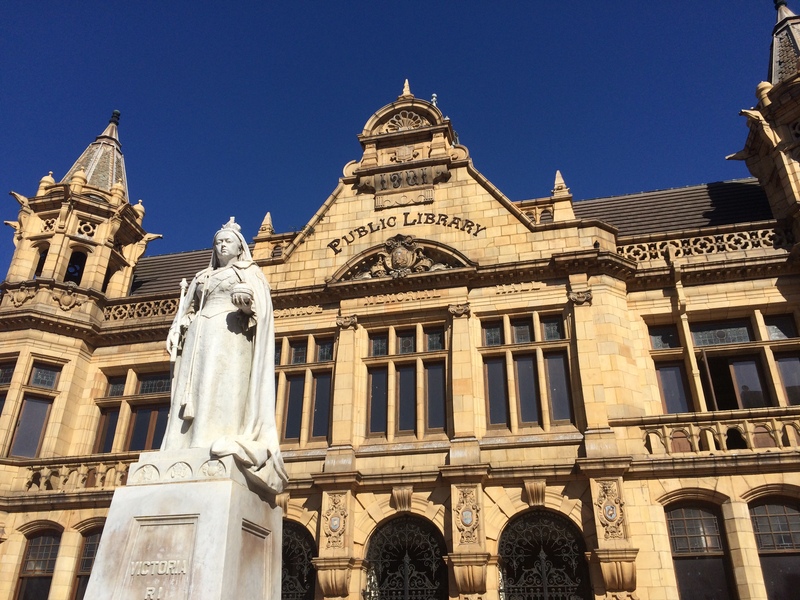 Back to the point that PE’s CBD has (and still is) undergoing an incredible rejuvenation. The stately old buildings with their gorgeous architecture are being renovated and upgraded back to their former graciousness and the whole area is becoming people-friendly. Public spaces dotted with art, coffee shops and breweries, old churches and statues, restaurants and performance spaces and, right up there in the Donkin Reserve (both literally and metaphorically), a pervading sense of the history of this – in South African terms – ancient city. 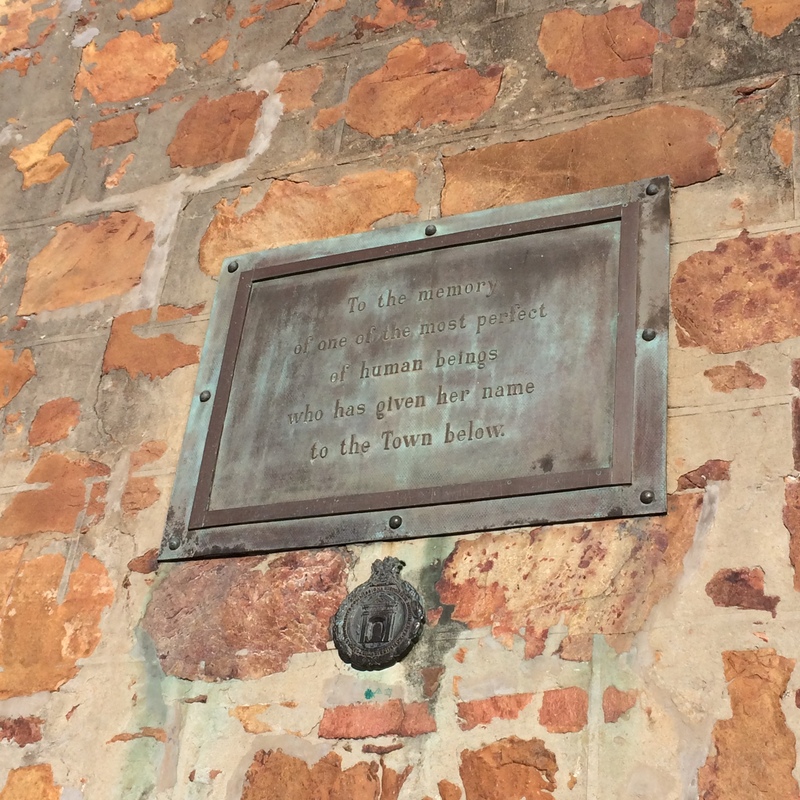 There’s plenty of history in this city, but that of its namesake and her husband is the most beautifully tragic and is the source of the somewhat unlikely pyramid up in the Donkin Reserve, slap-bang in the middle of the city. See? Tragic. Who in their right mind wouldn’t want to be loved like that? Without The Fever and dying bit, of course. Urban legend has it that he placed her head inside the pyramid. I like that. It’s macabre and beautiful. A new addition is a gorgeous, swirling mosaic – part of the 67 Steps, which I’ll write about in my next blog, this is getting too long! – that leads up to the pyramid, the lighthouse beaming behind it and the whole bay laid out in front. It is, without doubt, ‘The Balcony of Port Elizabeth’! Port Elizabeth balances on a hill. The Donkin Reserve, however, is on top of the hill and if you park on Athol Fugard Terrace, there are bricked pathways with a gentle slope to see all the cool things at Donkin Reserve. *We visited NMB as guests of the wonderful Nelson Mandela Bay Tourism. 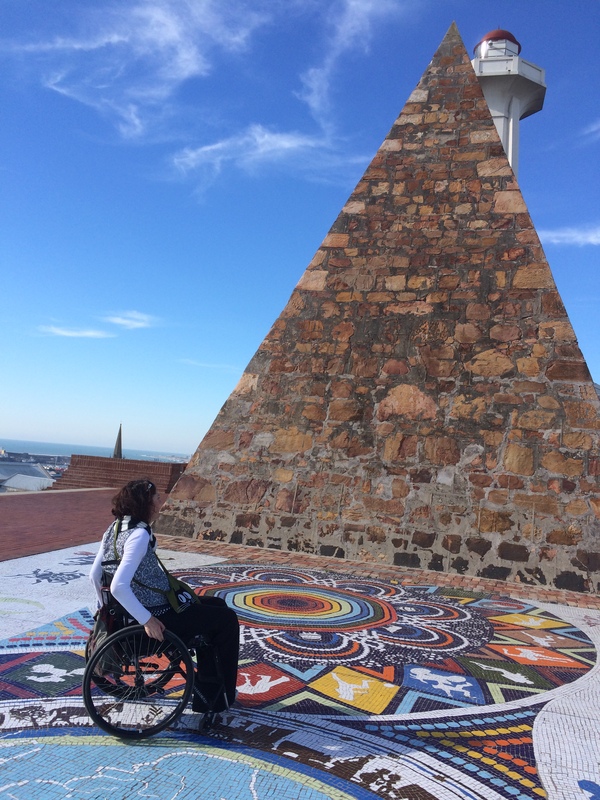 This entry was posted in Accessibility, Travel & Exploring and tagged Donkin Reserve, Nelson Mandela Bay, Port Elizabeth. Bookmark the permalink.